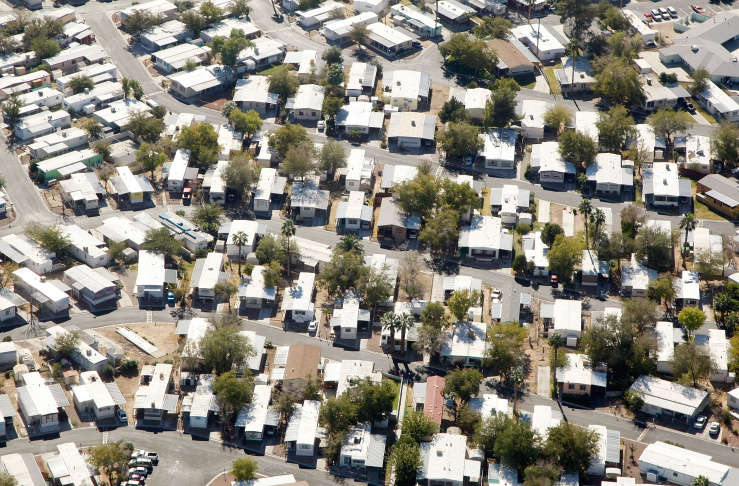 Rent control could soon be coming to mobile homes — or rather, the parks the homes sit on. Residents of mobile homes generally own their physical residence but rent the land where they park the structure. And in the same way apartment rents all over Los Angeles County have skyrocketed in the past few years, so too have rents in mobile home parks. That's why L.A. County Supervisor Janice Hahn has proposed an ordinance that would effectively bring rent control to mobile home parks in the county's unincorporated areas. On Tuesday, the Board of Supervisors is scheduled to consider a motion that would limit rent increases in mobile home parks to 3 percent each year. "It's really about protecting the tenants," Hahn told KPCC/LAist. "If we believe in affordable housing, and we believe in keeping these people from being homeless, we should really protect people who are in our mobile home parks in L.A. County." Hahn says the issue came to the attention of the board after residents in a Rowland Heights mobile home park reported their ground lease payments were becoming unaffordable. Notwithstanding this ordinance, there are few tenant protections allotted for mobile home residents in unincorporated L.A. County. Around California, about 100 jurisdictions have rules on the books that are similar to what's being proposed in L.A. County, according to the Mobile Home Park Home Owners Allegiance. That includes the city of Los Angeles and Riverside County. Mobile homeowners can be particularly vulnerable to rent increases because they can't necessarily just move, even if they want to, Hahn said. "You can't just pick up and move. Mobile homes, actually, aren't mobile," Hahn said. "They tell me that it costs maybe $60,000 to actually move your mobile home. It's a very expensive proposition. So, what happens, they can't afford the rising rent, they can't afford to actually move their mobile home. So, the landlord sometimes takes ownership of the mobile home, and begins the process all over again." The ordinance affects about 8,500 mobile home units in the unincorporated portions of L.A. County. It's technically a temporary "interim" ordinance. After 180 days, it will expire unless re-extended. Hahn said that's because their office heard landlords might try to raise rent in advance of a comprehensive rent control law, still in the works. On the flip side, mobile home park owners and operators worry the ordinance is premature, and that the county should more thoroughly study the extent to which mobile home park residents are rent burdened. "There's really no need to create a public policy solution for a problem that does not exist," said Jarryd Gonzales, a spokesperson for the Western Manufactured Housing Communities Association, which represents mobile home park owners. "We're saying take a wait-and-see approach, as opposed to rushing right in and limiting increases on rent, and going on in with a rent control ordinance." Rent control could have a lot of unintended consequences that could end up making things worse, Gonzales said. "If you're limiting the amount of rent increases, makes it harder for a park owner to have a fair rate of return on their investment," said Gonzales. "Because of the unpredictability of the rent increases, it makes it more difficult to want and be able to put in capital improvements to keep the parks up. If park owners are at a place where they're barely making ends meet, they may be forced to close." Hahn said she understands that concern, but argues that the urgency of L.A.'s homeless problem means the county must do everything in its power to keep people in the homes they already have. "We're not going to be able to build enough housing, build enough shelters, have enough bridge housing to get people off the streets," said Hahn. "We've got to keep people from falling into homelessness. That has to be a big part of our strategy to us. Stabilizing people's rent is a huge part of how we're tackling homelessness."